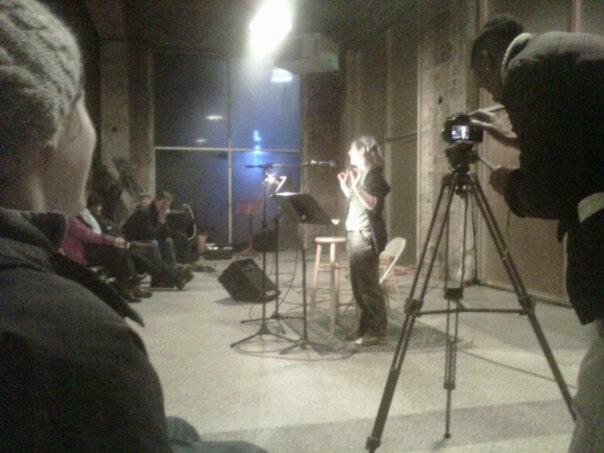 I told you about my first scheduled performance at Fisher Poets Gathering 2012, but I didn’t tell you what happened next. During the break, a tall, kind-eyed man introduced himself. Ifanyi Bell, digital producer with Oregon Public Broadcasting. He wanted to do a story about a greenhorn performer, someone brand-new to the Fisher Poets scene. Would I be interested? I recalled the fall course I’d taken with editor Brooke Warner. She’d rejected proposals based on the author’s nonexistent platform, and urged us to start building our online presence before shopping our books. Would I be interested? Ah, yes. With floor to ceiling windows and brick walls, the former car showroom was cold, but the company was warm. We bonded over our unique names, both familiar with using their mispronunciation to weed out telemarketers. (If-ahn-ee and Tell-ah, BTW.) Delightfully personable, he asked insightful questions about the culture of commercial fishing, storytelling, and where they intersect. Our interview re-routed into an almost two hour conversation. Ifanyi’s story went live on OPB this afternoon. Watching the finished video, I felt like I’d stepped into one of my favorite storytelling podcasts. His gifts as an interviewer had been apparent, but seeing the way that he pulled it all together was astonishing. Take a look, and keep an eye out for this man’s work. You can follow @ifanyi on Twitter. Thanks, Tom Hilton, for this photo. Serious skills you have, sir… Much gratitude for promoting my work with such generous artfulness.